The Island of Palmaria Hiking Trails offer a varying degrees of difficulty so whether you want to take a leisurely stroll to the beach or get your heart racing you can experience it all here. If you decide that you want to hike to the top of the Island which ha can ascend of 198 meters make sure that you are properly attired and equipped. Whichever way you decide to experience the Island of Palmaria, one thing is for sure - you are guaranteed fantastic scenic views of Portovenere and this part of the Gulf of La Spezia. 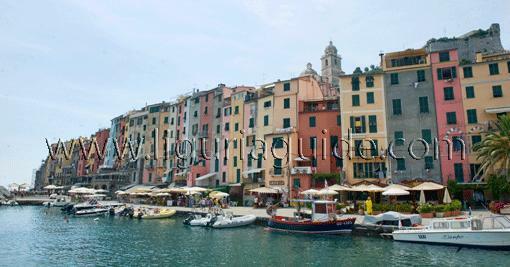 The Island can be reached by private boats or ferry services from La Spezia or Portovenere. The ferry service in Portovenere departs from Molo Doria and docks at Terrizzo from where you can begin exploring the island of Palmaria. To the left there is a wide dirt road which gently climbs along the part of the island facing the Gulf of Spezia and that lets us see the Fort Umberto I , Torre Scola and the many beaches of Cala della Fornace . You can take a detour and turn right off the trail going uphill, which will lead you to the former postelegrafic station in the Roccio area, considered one of the most beautiful terraces of Liguria. It is especially magical in the spring time filled with the blooming of Genista, red Valerian and red rock rose . 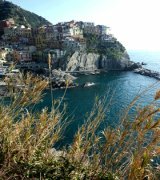 Continuing along the sentiero di mezza costa that runs along the south-facing side of the Island, you will be passing through alternating areas of Mediterranean shrubs and ilex , and in one point the trail will lead you making a steep descent that requires a bit of attention. Descending down, the path will lead to the beach and the second mooring place in Palmaria – Pozzale, from where you can take the boats and return to Terrizzo , Portovenere or Spezia. 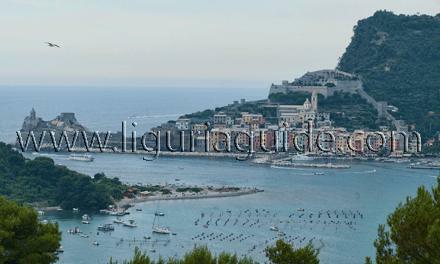 Here you will also find the second restaurant on the island - "Il Pozzale" - with full view of the Island of Tino. There is a pleasant stretch along the coast that connects the beaches with the surrounding area which is characterized by the remains of the portoro marble quarries. Portoro is a precious black marble with golden veins which was quarried here until about 30 years ago and now the abandoned quarries are the undisputed realm of gulls that nest there . From Pozzale you can take the trail and ascend to the top of Palmaria. Be warned that you will be climbing up through the most rugged and barren part of the hiking trail leading you some 186 m up above sea level . Hence make sure that you are properly equipped and have some water provisions with you. This trail offers some fantastic panoramic views over the vast open sea, as well as the Island of Tino and the cliffs populated by colonies of seagulls called Grotta dei Colombi (Cave of Doves) accessible only by coming down with climbing ropes. Reaching the top, there is a resting area where you can take a breather before continuing on the asphalted road . Here you have several options – if you turn left you will reach the Environmental Education Center (AEC ). While continuing down the road you can join the trail that branches off and leads to the most inaccessible part of the Island facing the Arpaia promontory where sits the church of San Pietro di Porto Venere . Mariella Tip - the hiking trail leading to the sea - Once you are in the Roccio area instead of continuing in the direction of Pozzale, go down the path towards the sea, thus arriving at the tip of the island. This spot is ideal for people that like to take a dip in tranquility as it can only be reached through this path , or from the sea by boat . 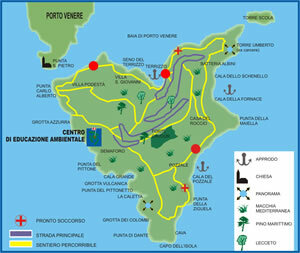 The Asphalt Road - it is the easiest of paths and it takes about 45 mins from Terrizzo leading to the top of the Island. The road is rarely crowded and has a smooth track and steady ascend to the top through the woods of the island. Strada dei Condannati - path connecting Environmental Education Center (AEC ) and Terrizzo - From the road, branch off to the right on the path taking you along the outer moat of the Fort Cavour, at the end of which you will join the path characterized by a series of turns and steps that allow you to admire views from different perspectives and altitude. Last but not least, you will be passing through areas enriched with the scents from aromatic plants and flowers like myrtle, rue, thyme, etc. Canalone - shortcut from Environmental Education Center (AEC ) to Terrizzo - Descend the stairs leading to the " Admiral's House " recognizable by the rather large pine tree, then follow the road and after a couple of turns, take the path on the left that passes through the most humid part of Palmaria. It takes about 20 minutes to reach Terrizzo. Here's where we are... 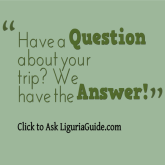 Check our virtual tour of the island !